Free Willy-Willy’s Mexicana Grill Burritos Today! Just spot Willy to get a free burrito! 1pm at the Willy’s Mexican Grill Kennesaw, GA 840 Barrett Parkway…..
Its Willy’s Mexicana Grill Anniversary tomorrow. 16 years. Willy himself is going around Atlanta locations. If you spot him you get a free burrito! 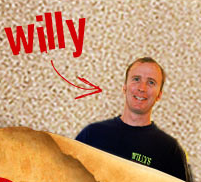 Here is a link to the Willy site. To see a list of locations. I read a great article in the AJC about Willy and how he started his business from the ground up.Always happy to read about entrepreneurs.